Caldecott winning illustrator Roger Duvoisin (1900–1980) and children’s publishing guru Alvin Tresselt (1916–2000) present a winning story as much a favorite in 1958 when it was first published as it is sure to be with this refreshed 2017 version. 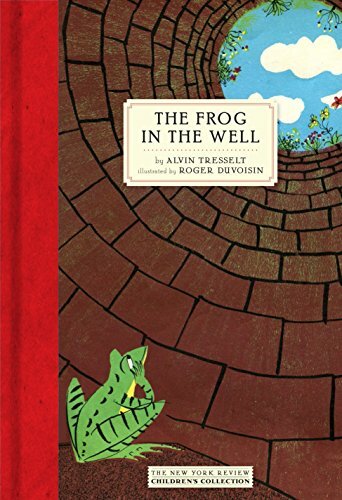 In this story, the title The Frog in the Well refers only to the opening scene where the reader is introduced to a content, robust, well fed, agreeable, and plucky frog living his life at the bottom of a well. He has all he needs and enjoys all he has: cool water, his handsome reflection, plentiful flies, and terrific views of the sun and moon—until one day, the well runs dry and the frog must take action or face his doom. Electing action he launches an adventure to see what is at the “end of the world.” Thus ends his time spent in the well, but not his connection to his bottom of the well home. Having no trouble getting out of the well, the frog is immediately amazed by what he finds. The end of the world has a fresh breeze, sunshine in every direction, flowers, trees, and an abundance of strange bugs for feasting delights. At first just reaching the outside of the well and seeing what there is to see satisfies the frog. He finds it easy to say he has reached the end of the world. Soon he realizes there may be more of interest if he goes on just a bit farther. He is curious enough to question his point of view. The frog is not yet done exploring. He journeys on and meets a variety of characters. First is a cow, then blackbirds, followed by the woodland animals—a deer, fox, squirrel, and bear—each marking a point of awakening awareness along his path. The frog encounters rain, marshes, brook and, at long last, fellow frogs welcome him to where he knows he belongs—a pond. However, it is not at all a given that frog should relocate his life to the end of the world pond away from his well. Perhaps, now that he has seen all there is to see in the world, his journey should end and he should go on home to the well where he was comfortable and happy. While the frog may be a bit vain and self-centered, he knows a good thing when he sees it and determines to bask in a new life amongst his own kind. With a subdued color palette and a retro mid-century artistic vibe, Duvoisin’s illustrations tell a lively story. There is energy, wonder, determination, and satisfaction at every page turn. A contemplative frog even raises a profound and unexpected question because it may never occur to the reader that the frog was better off in the well until frog voices the thought. It is this depth of character that rounds out the frog transforming him into an admirable fellow who makes the most out of his circumstances. It is the way in which the frog is depicted that enhances how the reader will relate to his experiences. The reader is sure to appreciate this resurgence of a children’s literature classic. This story is a gem, rich with artistry and meaning.